Telomeres are protective nucleoprotein regions at the end of chromosomes that shorten each time a cell divides. Telomeres are critical to cellular health and stability. Once they become critically short cell death (apoptosis) and replicative arrest (senescence) pathways are activated. Shalev I. and Hastings WJ. 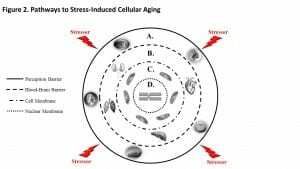 Psychological Stress and Cellular Aging. In Oxford Research Encyclopedia of Psychology. Ed. Oliver Braddick. New York: Oxford University Press (2018). DOI: 10.1093/acrefore/9780190236557.013.131. Person Level: Environmental cues are detected by various sensory organs (vision, smell, hearing, touch, taste). Sensory information is integrated in the brain. A→B: Stress induced changes are transmitted to the periphery along the SAM and HPA axes of the central nervous system. B. System Level: Systemic effects promote survival during stress including increased respiration in the lungs, accelerated heartrate, glucose release from the liver, and secretion of cortisol from the adrenal glands atop the kidneys. B→C: Cortisol permeates the cell membrane to promote adaptation within cells. C. Cellular Level: Cortisol binds to receptors within mitochondria, stimulating cellular respiration and energy production in the form of ATP. C→D: Free radicals generated by mitochondria bypass the nuclear membrane to oxidatively damage DNA. D. DNA Level: DNA damage activates cell death pathways leading to telomere shortening, cellular senescence, and accelerated cellular aging. Schematic representation of telomere length regulation by internal mechanisms. 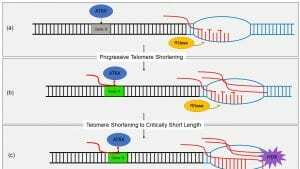 A) TERRA assists in recruitment of telomerase to telomere while shelterin stabilizes DNA. 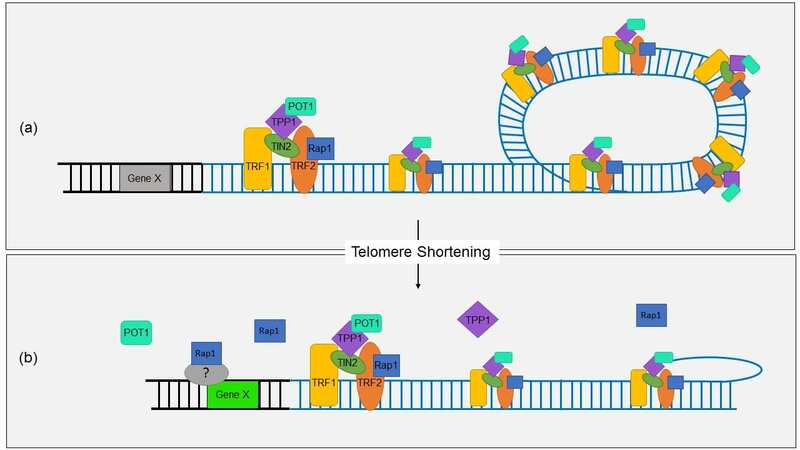 B) Telomerase elongates telomeres through addition of TTAGGG repeats to the leading strand. C) CST complex competitively excludes shelterin complex by binding to single-stranded DNA and recruits DNA polymerase. D) DNA polymerase elongates lagging strand of telomeric DNA, leaving a small 3’ overhang to which shelterin proteins remain bound. E) Shelterin proteins induce conformation of a T-loop structure to stabilize telomere ends. DNA is methylated in sub-telomeric regions, preventing further transcription of TERRA. Shalev I. and Hastings WJ. 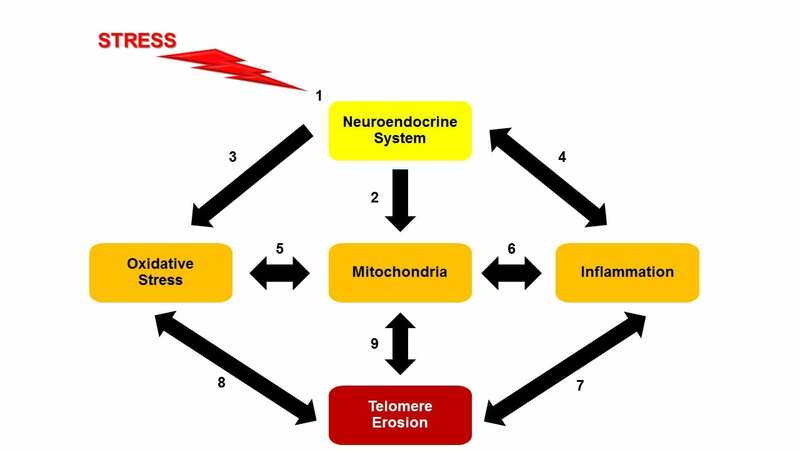 Psychosocial stress and telomere regulation. In Miu AC, Homberg JR, & Lesch KP (Eds). Genes, brain, and emotions: From resilience to psychopathology. Oxford, UK: Oxford University Press (in press). 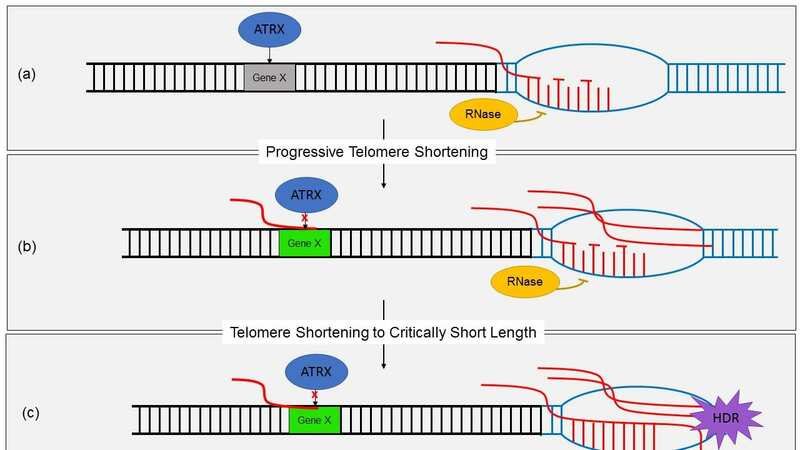 Schematic representation of telomere length regulation by stress-related mechanisms. 1) The human stress response initiated via the sympathetic-adrenal-medulla and hypothalamic-pituitary-adrenal axes stimulate the release of catecholamines and glucocorticoids into the periphery. 2) Cortisol release stimulates cellular metabolism through interaction with receptors in mitochondria. 3) Cortisol diminishes antioxidant production, disrupting their balance with free radicals, leading to oxidative stress within cells. 4) Chronic release of cortisol results in over-activation of the inflammatory response. Higher levels of inflammatory cytokines as a result of chronic inflammation also dampen diurnal rhythm of cortisol. 5) Increased cell metabolism increases production of reactive oxygen species (ROS) catalyzed by mitochondria. These can induce oxidative damage to cellular DNA, including mitochondrial DNA. 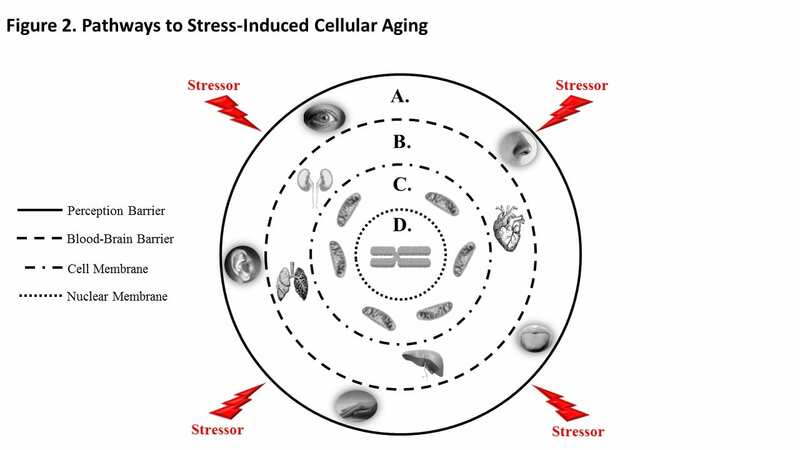 6) Under severe stress, damaged mitochondria release pro-inflammatory markers. Pro-inflammatory markers, in turn, can suppress mitochondrial function. 7) Inflammatory factors mark cells/tissues for degradation by macrophages. Damaged tissues are replenished by juvenile stem cells, decreasing TL as they divide and differentiate. Critically short telomeres activate senescent pathways, including release of inflammatory markers. 8) Free radicals permeate the nucleus to cause DNA damage, to which telomeres are especially susceptible. 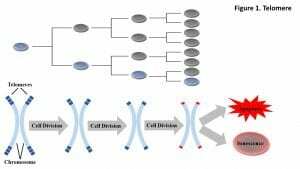 If left unrepaired, DNA damage triggers cell death pathways, further increasing stem-cell proliferation and TL erosion. Telomere-induced senescence increase levels of ROS. 9) During times of oxidative stress, TERT, the catalytic subunit of telomerase, localizes within mitochondria which can impair TL elongation. By contrast the age-associated decrease in mitochondrial activity can be rescued by enhancing TERT activity. Telomere Position Effect (TPE) and Telomere Position Effect-Over Long Distances (TPE-OLD). 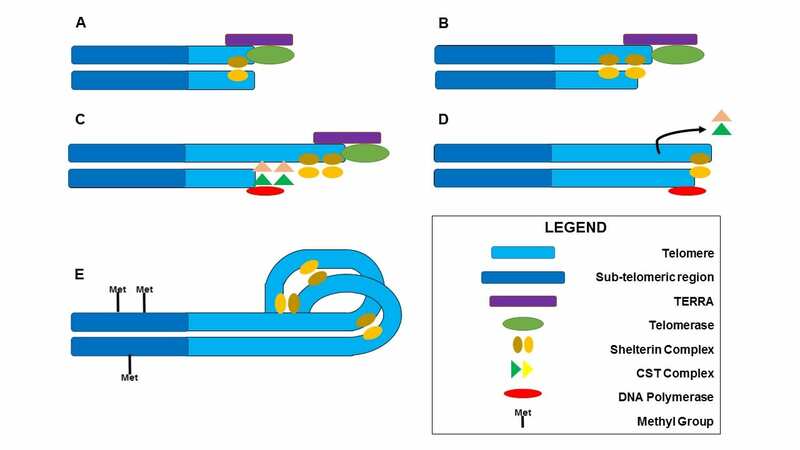 (a) Depiction of TPE-OLD silencing of gene X, possibly via interactions between chromatin loops and regulatory regions of the genome, and classic TPE silencing of gene Y. (b) Hypothesized increase in transcription of gene X with loss of TPE-OLD possibly due to chromatin conformational changes with progressive telomere shortening. (c) Depicted increase in transcription of gene Y with loss of classic TPE at critically short telomere lengths. Etzel LC and Shalev I. Effects of psychological stress on telomeres as genome regulators. In Handbook of Stress Volume 4: Stress Genetics, Epigenetics, Genomics. Ed. George Fink. Elsevier (in press). 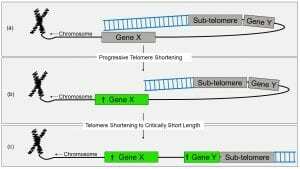 Changing impact of TERRA at telomeres and throughout the genome with shortening telomere length. (a) Depiction of role of TERRA at long telomeres in assisting the stabilization of telomeres during DNA replication. TERRA is degraded by RNAseH2 and regulated in a cell cycle-dependent manner. 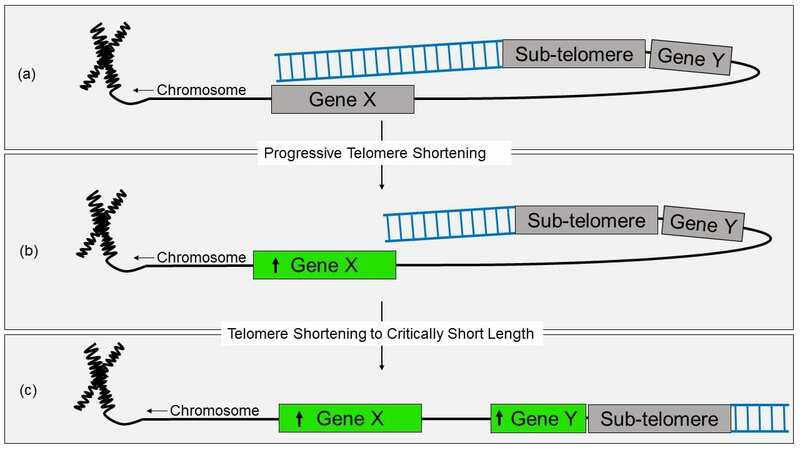 (b) Progressive telomere shortening may increase the levels of TERRA produced, possibly changing the availability of TERRA for extra-telomeric binding. Throughout the genome, TERRA competes with other binding factors, such as ATRX, for binding at intergenic regions. When TERRA binds instead of ATRX, gene transcription is upregulated. (c) At critically short telomere lengths, TERRA accumulates and forms RNA-DNA hybrid loops with telomeric DNA, interfering with DNA replication and promoting homology-directed repair (HDR) of telomeres. 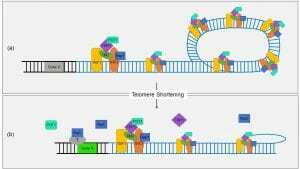 Telomeres functioning as sequestration sites for shelterin proteins. (a) Depiction of the six-subunit shelterin complex binding to telomeric DNA in the t-loop conformation. TRF1 and TRF2 bind as dimers directly to telomeric DNA, while TIN2, Rap1, TPP1, and POT1 associate in a complex around TRF1 and 2. (b) As telomeres shorten, concentrations of these proteins increase in the nucleus, increasing the likelihood of extra-telomeric binding. For example, Rap1 binding (possibly with additional factors) changes transcription of genes associated with cell metabolism, cellular adhesion, and apoptosis. Blood sample cell composition and telomere length measurement. The figure shows aging-related changes in blood-leukocyte populations and illustrates how aging-related changes to leukocyte composition can affect telomere length measurements. 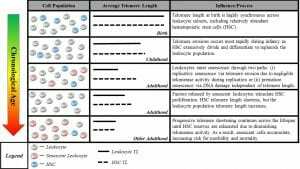 Many studies report average telomere length from leukocytes, a heterogeneous class comprised of multiple distinct cell-types including granulocytes, lymphocytes, monocytes, as well as hematopoietic stem cells (HSC). 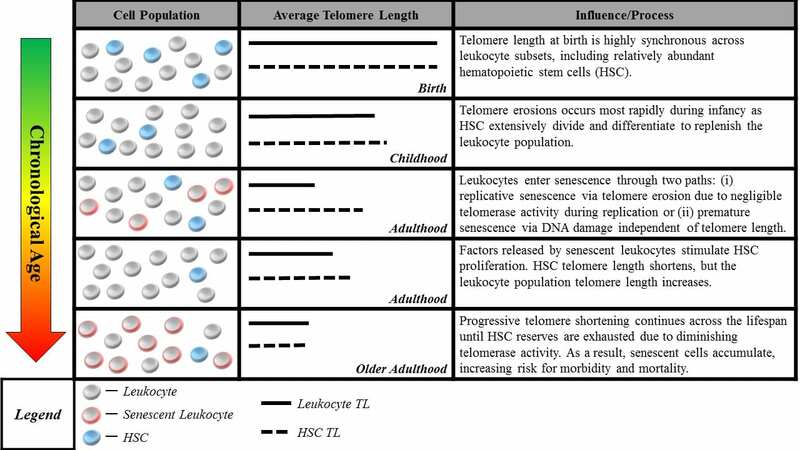 Although telomere length is highly synchronous across leukocyte subsets at birth (Kimura et al., 2010), it can be significantly variable across the life course, with HSC telomeres tending to be longer than those of granulocytes and monocytes (Lasho et al., 2013). Telomere length in HSC most accurately captures the aging process, representing the organism’s capacity for self-renewal. However, only naïve, newly differentiated leukocytes have telomeres closely resembling that of HSC progenitors, while older leukocytes have shorter telomere length (Kimura et al., 2010), indicating closer proximity to senescence. This distribution of lengths resulting from leukocyte turnover makes it difficult to parse out whether differences in telomere length are attributable to blood-sample leukocyte composition or an exposure of interest. Cell-type heterogeneity can be partially corrected for, e.g. using complete blood count data (Cole, 2010), but the potential to confound telomere measurements remains a concern.